Please note: This title also has a student CD package available. To add this item to your shopping cart, click here (not the button above). Visión y voz 3e adopts a fresh, easy-to-use, discourse-based approach that offers unique, input-rich activities that accommodate a variety of teaching and learning styles. Interactive, learner-centered, popular, and effective, this Beginning Spanish program engages students to experience the world through its variety of people and places. Students learn to use Spanish to sound their own voices and express their own views, to speak Spanish in real professional and personal situationsand to do it well! 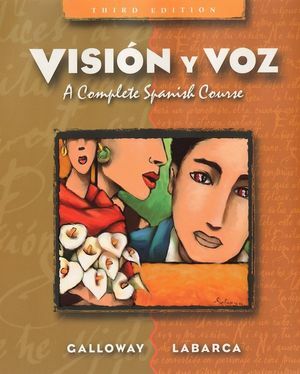 Vicki Galloway is the author of Vision y voz: A Complete Spanish Course, 3rd Edition, published by Wiley. Angela Labarca is the author of Vision y voz: A Complete Spanish Course, 3rd Edition, published by Wiley. Capitulo 1	Hola, ¿que tal? Capitulo 3	¡Viva el finsemanismo! Capitulo 11	¿Que me pongo? Capitulo 15	¿Que nos reserva el futuro?